Acquired from the artist (1940s). Collection of Oscar Molinari de Herrera, Caracas. Considered a pre-eminent Modernist in Venezuela, Francisco Narváez, (1905-1982) began his artistic trajectory in the 1930s with works that exult the truly native and ethnic in Venezuelan culture. His sculptures, especially public commissions, reflect an aesthetic that is heroic and monumentalizes the nativist tendencies so prevalent at the time which glorified a sense of national identity. Born in the island of Margarita in 1905, the artist's father was a craftsman and cabinet maker; it is probably from him that he acquired his early affinities for carving and sculpting--especially in wood; Narváez was drawn to the natural woods and stones of his native Venezuela, preferring them for his artistic production. The artist first received his training at the Academia de Bellas Artes de Caracas but in 1928, traveled to Paris to study at the Academy Julian. While in Paris, he studied the work of Rodin and Maillol but he also became in contact with the arts of Africa and Oceania which at the time, were of enormous interest to the Surrealists and other avant-garde groups. Returning to Caracas in 1931 after participating in a selection of exhibitions in Paris including the Independents Salon, Narváez established a workshop in the capital that would become a center for artists and intellectuals alike. 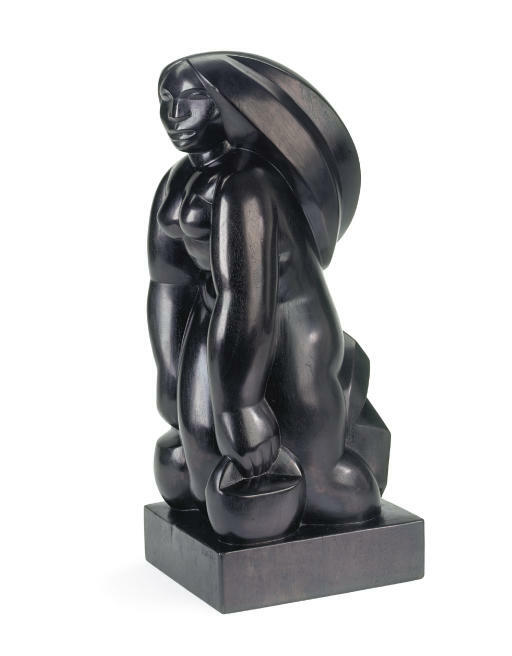 Masterfully executed in highly polished ebony, this remarkable work exhibits the abstracted characteristics of Narváez public sculptural pieces and has the weight and mass of a marble or stone. The artist's great sensibility with modern forms in movement and volume is only surpassed by his subtle skill in describing the whole of the figure--it is full of grace but also power. Though endowed with absolute force, the figure remains an object of immense beauty and quiet dignity.